When I was younger one of my favourite game franchises was the Command & Conquer series, in particular Red Alert (1 and 2). They were real-time strategy, or RTS, games, where you built your base, harvested resources, trained your soldiers, and invested in high-tech weaponry all whilst being attacked by your opponents (either other players, or the computer AI). If I’m honest, my game tactics were always a little shaky. I was more likely to throw everything I had on mad, suicidal, missions against the other team, rather than spending the time to properly invest in the infrastructure of my base. In extreme cases I would even sell all my buildings, spend all the money on infantry and send everyone in. Surprisingly this actually worked. Sometimes. My friend Tom however, he was good at these games. He always had a strategy. A proper one, not the crazy, oh-my-there’s-a-tesla-coil-right-there-RUN-AWAY!, one that I’d be using. 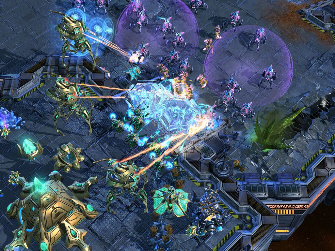 He’s been spending time recently on StarCraft 2, another RTS game where you try to become master of a region of space by colonising planets, displacing the territory of the two other rival civilisations as you go. Tom’s not just a game player though – he’s also an astronomer. Turns out when you combine gaming astronomers (Tom & his colleague Duncan) with real StarCraft gameplay data and realistic simulations of colonisation, based on our own Milky Way, what you end up with is a model of interstellar species expansion. Unsurprisingly the game is pretty evenly balanced (to prevent any one species or strategy from dominating), but the simulations do suggest that one of the races, the Terrans, tend to win out if they put pressure on their opponents early. Using game data to investigate real-world problems has been around for a few years now. It began when researchers realised that the spread of a virtual plague in World of Warcraft shared many similarities with the spread of real viruses. Tom and Duncan’s results aren’t meant to directly relate to how real aliens could be spreading through the Galaxy right now (and they definitely don’t want to give the impression that “…intellects vast and cool and unsympathetic, regarded this earth with envious eyes, and slowly and surely drew their plans against us”). However, they do demonstrate the potential power in-game data has for future work in this area. You can read more about their work at http://www.roe.ac.uk/~tat/StarCraftScience.html or on Duncan’s own blog here.